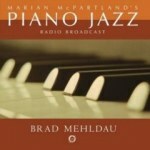 McPartland and Mehldau offer up an easy, painless introduction into the world of piano jazz. In jazz years, Marian McPartland is roughly 250 years old. Born in 1918, McPartland has witnessed the Hot Five, the birth of the cool, Weather Report, and Kenny G. You know that famous old photo with all those jazz greats in front of a house in Harlem? Dizzy Gillespie is in that photo. So are Lester Young, Count Basie, and Thelonius Monk. Marian McPartland is, too -- one of three women and sure as hell the only white woman in it. Her radio show, Marian McPartland’s Piano Jazz, is NPR’s longest running program, and an appearance there is the only thing that Henry Mancini, Elvis Costello, and Alicia Keys have in common. McPartland has done much over her long career to introduce jazz to the layperson, breaking down the walls of the boys’ club and presenting mainstream artists in a familiar, unthreatening environment. Nearly forty years her junior, Brad Mehldau has made a name for himself by taking popular songs and refitting them to suit his tastes. Covering Radiohead and Nick Drake long before Christopher O’Riley’s Starbucks-ready albums appeared on the market, Mehldau's affinity for turning pop songs into intimate jazz masterworks has made him one of the most well-known jazz artists working today. Like McPartland, Mehldau also has the ability to hold the interest of non-jazz fans that don’t know the difference between bebop and hard bop (what easier way to delve into jazz than through Elliott Smith covers, or a searing take on “Nice Dream”?). Taken from a 1996 recording session, Marian McPartland’s Piano Jazz is of interest as a musical history piece that documents the meeting of two great jazz minds who have, each in their own way, brought jazz out of the orchestra wings and put it back on stage. The music is, like all of McPartland’s shows, smooth and eminently listenable. Mehldau stays away from his pop covers here, instead presenting a mix of original tunes and old jazz favorites. “From This Moment On” leads off with Mehldau’s signature time changes, along with a driving left hand that keeps the song grounded while the melody floats along on top. His original “Ron’s Place” features the same contrapuntal lines, with a more meandering feel; it’s hard to tell when the melody stops and the solo begins. McPartland talks repeatedly of her love for ballads, and plays a beautiful version of “I Get Along Without You Very Well”. She opens the song by repeating the main line several times, going up the keyboard higher and higher, adding pauses and breaks to let the phrase breathe and give it time to sink in, all of which makes this oldest and most clichéd of songs seem new. She follows the same pattern during the outro, bringing her audience back down to earth with a gentle touch without the self-conscious musical posturing or vanity that another player might have employed. Music aside, the real draw of this CD is the conversation between two artists creating a common ground in their experiences and musical careers. Mehldau tells the story of his parents’ first date in 1958, at a Marian McPartland show at the Hickory House in Greenwich Village, and McPartland happily informs us that “All my Hickory House couples stay married…musical matchmaker, that’s me!” But the conversation isn’t limited to talking here: on a duet of “Our Love Is Here to Stay”, their styles match up perfectly, as though they’d been on the road together for years. Mehldau says afterwards that the tune “lends itself to a whimsical, bluesy kind of feeling” and McPartland agrees, exclaiming, “That’s what we did! Whimsical and bluesy!” The two also re-work “Stella by Starlight” from a sappy ballad into a snappy, swinging jaunt of a song. Though the music is always tuneful, sometimes the conversation does get awkward. For someone who takes such a literate, intelligent approach to all aspects of his music, Mehldau’s repeated, half-hearted “Yeah” to many of McPartland’s questions seems out of place. And when McPartland earnestly tells her guest, “I feel like I know you, from hearing all your music”, Mehldau’s unenthusiastic “Oh, great” response comes across as almost rude. Perhaps all this is to be expected from a young player in the presence of a bona fide grande dame of American jazz, but a little laughter and joking would be welcome additions to all the cooing and gushing. That being said, if you are looking for a completely painless, easy-on-the-ears entry into jazz, you can’t go wrong with spending some quality time with Marian and Brad.